DETROIT — President Donald Trump claimed direct credit Tuesday for Toyota’s new investment in a Kentucky plant, calling it new evidence of economic improvement in a White House discussion with CEOs. The company says the move was planned long before Trump even announced he was running for president. It’s not the first time Trump has veered from reality when claiming he’s produced new jobs in his 82 days in office. THE FACTS: Trump had nothing to do with the changes that Toyota announced. The company says it’s the culmination of plans in the works for at least four years. The investment is part of revamping the underpinnings of Toyota’s midsize Camry sedan, long the best-selling car in the United States. Such a change requires years to plan and doesn’t hinge on the economic conditions of the moment. The company initially said Trump’s comment was added at the request of the White House. The administration countered that Toyota had asked for it. 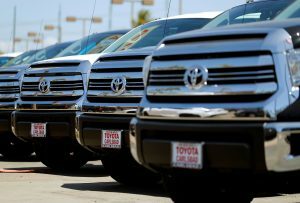 On Monday, Toyota said it had requested a Trump comment.